For tonight's movie, +Sarah Weitzel and I, we went to +Brian Carter's house to watch "Night of the Living Dead" with him and +Mark Ricci. It turned out to be a pretty good movie even though it was in blank and white and had almost no special effects. I had already seen the remake of it, but I had not seen this original version yet. We were even able to find the extended "uncut" version of the movie on DVD. The movie is a pretty basic one and it moves along a zombie slow pace, but it is still a good one to watch with friends. The strangest thing about the movie was the lack of zombie makeup. It was either that or it just didn't show up well on the black and white film. The zombies kept reminding me of Frankenstein monsters with the way they looked and acted. The story revolves around a group of people that happen to hold up in an old farm house. The zombies begin to attack the building and the survivors must find a way to protect themselves by barricading the doors and windows. Luckily, the zombies are slow and dim witted so that isn't a huge challenge. The biggest challenge ends up being just putting up with each other. The zombies in the movie were pretty basic. They were "possibly" created when a space probe carrying radioactive material is detonated above the Earth's atmosphere. It causes all of the dead to rise up and to hunger for the flesh of the living. 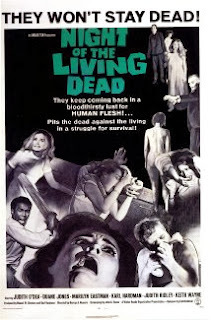 The dead coming back to life is a huge shock to those left alive and things quickly escalate out of control. Here is my quick zombie summary. I won't spend much time going into it since there was nothing that strange about the zombies and they didn't really go into much detail about them. If you have not seen this one yet then I recommend that you check it or the remake out. It might be a little slow for some of you out there, but if you are watching it with a bunch of friends then you will have a great time anyway. It is definitely the kind of movie where you can add in your own lines or scream at the characters to do something different. We had a lot of fun tonight and we still have a long way to go so make sure to check back as we continue on our adventure in #undeadOctober.